Some people really love to read on their mobile devices — but for others, it’s a convenience that they can’t live without and try not to hate. If you have an iPhone or iPad, Apple’s built-in iBooks reading app provides a flexible and intuitive reading experience, but it’s not the only game in town. An elegant app called Read, which handles books only in the ePub format, is challenging iBooks on a number of points. Read is a pleasant alternative that adds valuable features to make the experience more useful for certain readers. For example, it encourages productivity in the form of highlighting and saving book passages and makes those tasks easy to accomplish. 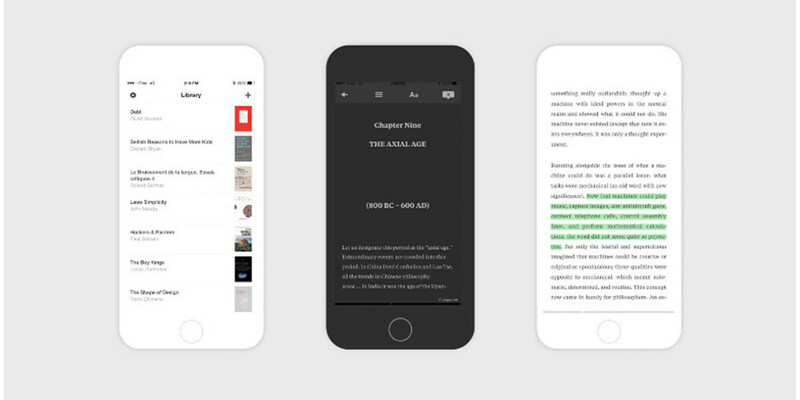 The app uses APIs from Dropbox and Evernote to help users easily save and access literary references and accelerates the process of finding them. One added value is a feature that makes it more convenient to take notes on your reading and gather quotes from your book in one place. You can synchronize all your highlights into Evernote, where they are saved automatically into a dedicated notebook. If you sign into the app, it will appear on all of your iOS devices and automatically direct you to the last page you read on any of them so you can quickly pick up where you left off. Read also sends you a weekly recap with your highlights via email. What’s available to read on Read? Well, tons. It incorporates public domain catalogs of Feedbooks and Project Gutenberg directly in the app in a more graceful design than a standard eBook search interface, thus making it easier to navigate among free ebooks libraries directly from the home menu. What’s it like to read? Read has a minimalist interface that lets you do things like change the background from black (with white type) to white or sepia with black type. A slider lets you adjust the size of the font. You can page through the book by flipping sideways or use the vertical scrolling view. And you can adjust the background lighting right within the app. A tap on the screen brings up Read’s controls, and you can access them anywhere on the page. The main menu lets you toggle between the text and the chapter headings. The back arrow lets you access the books you have stored in your library. Why confine it strictly to the ePub format? The main advantage of ePubs lies in the adaptive formatting, Read CEO Simon Guigue told TNW. With it, readers can personalize fonts, margins, colors, and more. Increasingly, institutions such as the European Union and Microsoft use ePub as a alternative to PDF, another dominant format found in iBooks. Whereas PDF is a digital copy of an printed page, ePub naturally reflows and acts more natively mobile. But if there are glitches in the original ePub document, they will show up in Read as well. As an ePub engine, everything in Read depends on the original document. Lots of websites do not entirely follow the right procedures and people reading their own documents in ePub or books coming from various websites sometimes are confronted with bad typography. It’s not the app’s fault, but it’s still annoying. From Read’s perspective, third-party app integration is the big differentiator. Pairing different services together creates a brand new kind of app, more valuable than the services used separately: APIs create value from connecting dots. For the record, iBooks also supports the ePub file format as well as PDFs, MP3 audiobooks, AAC audiobooks and audible.com audiobooks and if you want to add books, audiobooks, and PDFs from outside the iBooks Store or audible.com, they need to be DRM-free. Some PDFs might not be compatible with iBooks. I enjoyed Read, and if I had to take notes and track quotes from books, I would find Read the superior experience because of its integrations with Dropbox and Evernote. More casual readers will of course enjoy Read too, but I’m betting that the greater flexibility of iBooks will continue to keep Apple’s app popular. Since both apps are free, it’s worth giving Read a try to see if you derive extra benefit from its integrations.